Even though today was a rainy and miserable fall day, there was a bit of a bright spot when I returned home from a long day at the office. 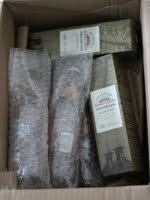 The fine folks at Innis & Gunn we kind enough to send us their new "Highland Cask" beer along with a few others to review. After enjoying their "Canada Day" special edition beer (click here for review), I am sure this will be delightful as well. delight both the nose and the palette. Keep your eyes peeled for a review in the next week or so!